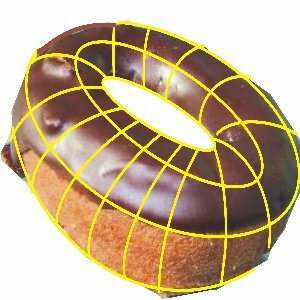 The Physics Groupie Blog: Dunk Your Homeomorphic Toroidal Polyhedrons? You see them in the market, hanging on women's ears (and some men's), dangling through people's noses, orbiting around kid's wastes, and even the token of eternal love at your average wedding. Of course I'm talking about the homeomorphic toroidal polyhedron, aka the donut (or ring, or hoop). To the mathematician, specifically one who studies topology, this shape is all too familiar. Explained to a child, a torus is a surface of revolution generated by revolving a circle in three dimensional space about an axis coplanar with the circle. So the next time you visit your local Krispy Kreme shop, just ask for a Glazed HTP and see what kind of reaction you get. While it is in fact a torus. I must, however, differ on your description of the above mentioned annulus of chocolate dipped deliciocity as a polyhedron. The defining feature of polyhedra are the flat faces or sides from which their name derives.